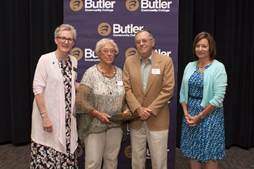 Nearly 60 donors gathered on June 22 in the Hubbard Welcome Center to celebrate and honor amongst themselves those who have made commitments to Butler in the form of an estate gift. College President Kim Krull welcomed guests and thanked those present for being philanthropists. “You are improving humankind by providing funds, usually scholarships, for Butler students,” she said. Four individuals and couples were inducted into the Circle of the Gold Society this year, the Foundation’s planned giving recognition society. · Joseph Bayles – Wichita, Kan.
· Gerald and Elsie Haines – El Dorado, Kan.
· Mal and Janice Shaffer – El Dorado, Kan.
· Robert Widener – Raytown, Mo. Donors who are recognized at the annual event have made a commitment in writing to the Foundation. Recent Hubbard Award of Excellence winner Kaylee Farmer was the special guest speaker. Farmer is currently an intern at the Livestock Marketing Association in Kansas City where she met three other Butler alumni. She discovered they all had one thing in common: how much they loved the college. A special check presentation of $5,000 was made by Jim and Sally Hargrove on behalf of an anonymous donor who utilizes Hargrove’s legal services. “I encourage my clients, when I can, to take this well-deserved recognition,” Hargrove said. Sponsors for the event were The Commerce Trust Company, Hargrove Law Office/Jim and Sally Hargrove, and Lance and Lisa Lechtenberg. For more information about the Butler Community College Foundation visit our website athttp://foundation.butlercc.edu or find us on Facebook.